This is an artwork I worked on with Kelly Meyer who helped out with art direction and research. This is our entry into TALK! TALK! Korea 2016's talent contest for a chance to win a trip over with 5 others to be broadcast by KBS. This years theme was focused on the Hanbok (traditional Korean dress), so we had to make use of all we could to best express Korea through our eyes based on the theme. We wanted to push the colours and content as far as possible without it becoming too overwhelming. 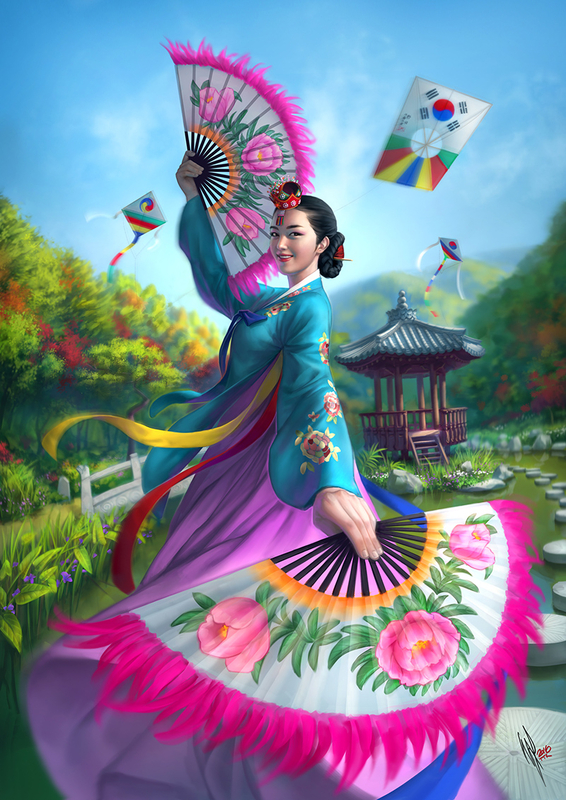 The location is based on the Garden of Morning Calm in Gapyeong and she is wearing a Dangui Hanbok. The hardest challenge for me personally was figuring out how to handle the environment but with a few studies, decent reference, and a few PS brushes created specifically for it, I managed to make it work.